Outside, dark grey clouds hang in an oyster blue sky. The rain has eased and all is quiet until, just there, from the south, down the street, I hear the call. It’s a faint “Honh!” Iike a French adolescent clearing his throat, first one, then another. I rise and step to the window. I pull aside the curtain and peer upward. “Honh, honh” gets closer, is repeated. Different voices echo the first, and craning my neck, I see them, a vee of dark wings just above the treetops. Black necks, white cheeks, beaks pointing north, they “honh” to one another. Passing instructions? Keeping tabs? Giving encouragement? They fly over my house, and I can see their fingertip feathers against the paling sky. 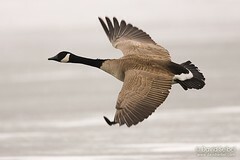 Now past, continuing onward, their calls fade with distance as they travel, as they head north to their nesting grounds. Every year, I hear them–south-bound in winter, north-bound in spring–and every time I smile. I live right along their route, right along the necklace of lakes and ponds that guide them: Green Lake, Bitter Lake, Twin Ponds, Ronald Bog, Echo Lake, and beyond. They’re a bit early this year. A mild spring, then, and an early summer ahead.